tea represents a healing and relaxing life. Coffee, a drink that many see as an elixir for vitality, can be found everywhere in Korea nowadays. As one of the biggest coffee-consuming countries, Korea’s coffee industry is steadily growing as the society gets busier. But in recent years, there are some people turning to another drink for relaxation - tea. Bubble tea and milk tea become favorite desserts among young people, and tea-specialized cafes such as Gongcha and Osulloc are gaining great popularity. Why are so many people fond of tea? The UOS Times ventures into both Eastern and Western tea culture to find the real meaning of tea in modern culture and daily life. 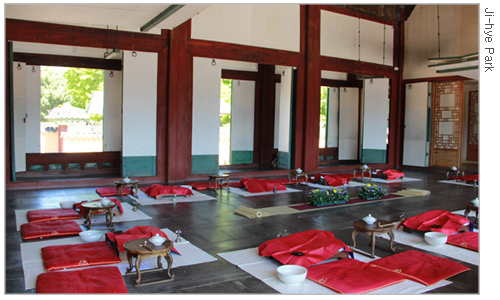 Each weekend during spring and fall, there is a tea ceremony held in Jagyeongjun, the former queen’s sleeping quarters in Gyeongbokgung Palace. Contrary to the two largest and most visited buildings in the palace, Geunjeongjun Hall or Gyeonghoeru Pavilion, Jagyeongjun is calm and silent. Only a few people pass by, making it a very suitable place for a tea ceremony. After participants gather, the host of the event explains in detail all the steps of a traditional Korean tea ceremony. The event illustrates the Korean attitude toward tea, which can also be found throughout northeast Asia, in Japan and China. The origin of Eastern tea culture was China. 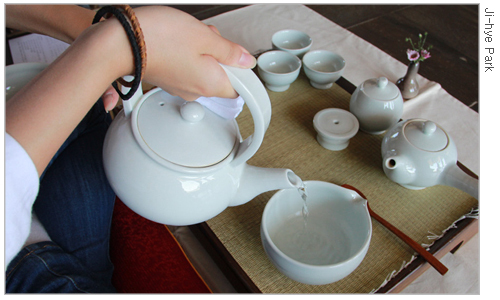 The tea ceremony was first laid out in a book in eighth century China, and it spread to Korea and Japan. Tea culture was first introduced to Korea through Buddhism during the Three Kingdoms era, and it was prevalent throughout society, from royal rituals to the daily lives of commoners during the Koryo Dynasty, which encouraged the spread of Buddhism. Tea ceremonies had a more spiritual aspect at that time. It declined under the atmosphere of the Joseon Dynasty, which suppressed Buddhism and favored Confucianism, but theoretical and practical parts of tea culture were restored in the 18th century. The ceremonies held these days at Gyeongbokgung more closely resemble the technical ceremony of the Joseon period. The host emphasizes manners. This keyword penetrates the whole tea ceremony from the position of each tea set to one’s attitude of mind. Politeness and courtesy steeps every part of the ceremony. Of course, it is not an easy thing to memorize and follow all the strict orders of a tea ceremony, but one soon begins to realize that these steps are a way of expressing one’s dignity or showing respect to others, and anyone who joins it will find delight in this. After one hour of the experience, I was also quite impressed. A cozy breeze and beautiful fall weather harmonized with the green tea. The tea ceremony at Gyeongbokgung Palace truly reflects the beauty of the environment and relaxation of daily life which our ancestors were aiming for. 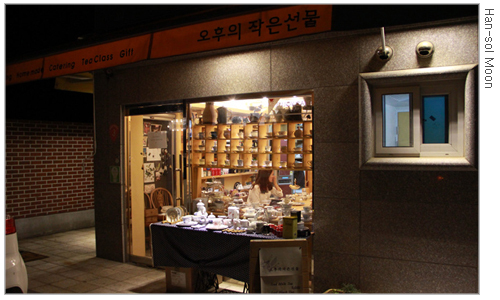 To show us the similarities and differences between that ancient Asian tea tradition and the western custom, a small cafe in the Hongdae area of Seoul prepared a small tea party just for The UOS Times. The cafe was just a few minutes’ walk from the crowded subway station. It was small but comforting, attractive especially to women customers. Tea cups, each with a unique decoration, were arranged neatly on a shelf, and teas from a variety of countries were on offer. The tea we tried at this party was a brand from India called Dazzling. After brewing, its color is orange, and its taste is soft and sweet compared to other teas. Our host told us about the interesting rules of a British tea party and provided information about western tea culture. 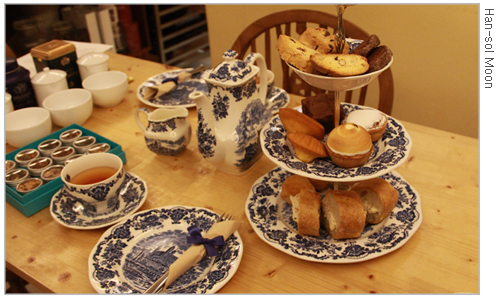 She said that the traditional tea party, or afternoon tea, originally came from the United Kingdom (UK). According to legend, the custom as the world knows it today began in the mid 1800’s after a duchess, or aristocratic woman, ordered a simple meal to have between lunch and dinner. This has quickly spread throughout British society, and even nowadays, they enjoy tea in their daily lives. After participating in tea culture, I realized that there is a beauty to slowness. Perhaps what makes tea so special rather than coffee comes from the brewing. The more time one spends, the deeper its taste becomes, the deeper its scent spreads, and the more relaxed we are. There was another value that both cultures were emphasizing, “We” - a relationship with others. Of course, each culture pursues distinct etiquettes and atmospheres. However, the basis of both is that we try to be harmonized with others. How about taking a breath and sipping some tea with special people this weekend, rather than sitting at the coffee shop?